The Mekong River is the lifeblood of mainland Southeast Asia. It flows through six countries and affects the lives of some 60 million people. 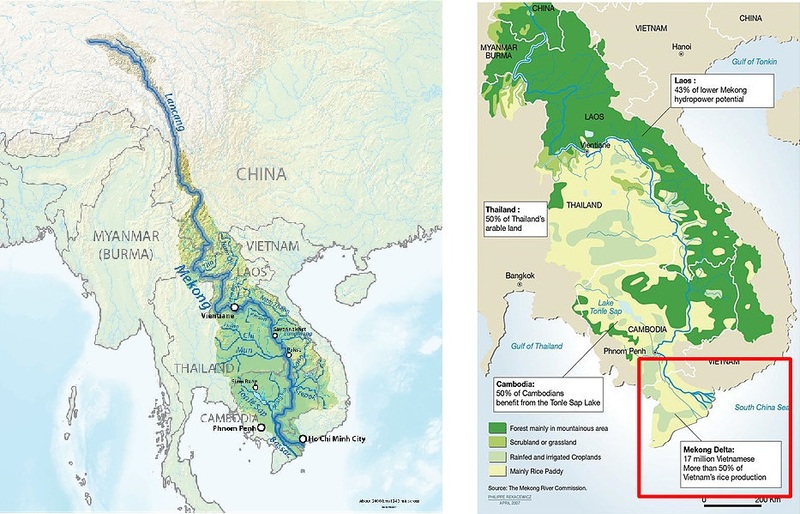 China and Laos are damming the river in many places. And Thailand is planning a large-scale of diversion of water that could further affect its flow. 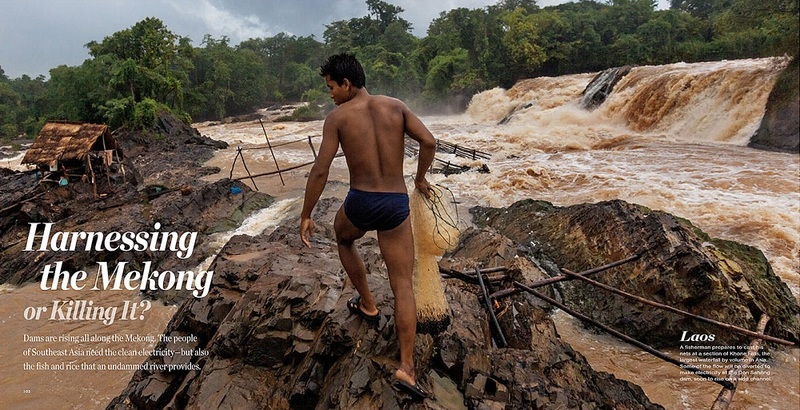 It’s still an open question whether the dams in Laos can be financed. Will Beijing step in? This is the second article of an in-depth, four-part series exploring threats facing the Mekong Delta and how they might be addressed. Read the first, third and fourth installments. Nothing that influences the future of Vietnam’s Mekong Delta induces more angst than the hydroelectric dam projects on the mainstream of the Mekong, upriver from the Delta. A handful of Vietnamese experts have been sounding the alarm for years. That hasn’t translated to effective diplomacy by the government in Hanoi, which may have concluded — perhaps correctly — that resistance is futile. 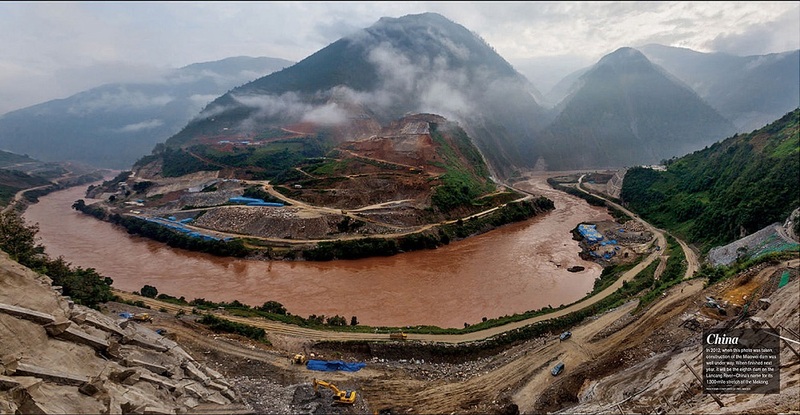 Seven dams are already operating on the Lancang River (the Chinese portion of the Mekong) in the steep gorges of Yunnan province. Another mainstream dam is nearing completion in upper Laos, construction will soon begin on yet another at the Don Sahong rapids just north of the Laos-Cambodia border, and nine more are projected — seven in Laos and two in Cambodia. Imagine a future in which Mekong Delta farmers can no longer rely on the river’s annual flood pulse to flush out salt intrusion and bring new fertility in the form of silt washed down from mountains far to the north. That future has already arrived. It is manifesting in a lower and later annual flood crest and a sharp reduction, perhaps already as much as one-half, in the river’s sediment load. As these dams are built upstream, their impact on the fertility of agriculture downstream and on the river’s fish stocks will be progressively devastating. There is simply no doubt of this. Consider, for example, the dam cascade’s impact on the Tonle Sap, Southeast Asia’s largest freshwater lake. Its seasonal flooding is a hydrological wonder. The lake lies in a huge depression in central Cambodia. It is connected to the Mekong mainstream by the 120-kilometer Sap River. During the dry season, from December through June, the Sap drains the lake. Then, when the monsoon rains come and the Mekong rises, the Sap’s flow reverses, and 20 percent of the Mekong’s floodwaters pour into the Tonle Sap. The area of the lake expands from 2,700 square kilometers to 16,000 square kilometers and its volume increases by 80 times. In this manner, the Tonle Sap has regulated the supply of water to the Delta downstream for as long as people have farmed there (and doubtless for eons before), smoothing and extending the flood pulse. As dams are built in the Mekong’s middle reaches, however, the Tonle Sap may no longer fill as usual in the wet season nor drain properly in the dry season. If, or more likely when, that happens, the Delta’s hydrological rhythm will be undone, and with that, the highly engineered foundations of its agriculture. Although Laos, Thailand, Cambodia and Vietnam pledged in 1995 to “cooperate in the maintenance of flows on the mainstream…and to enable the acceptable natural reverse flow of the Tonle Sap to take place during the wet season,” as a matter of international politics, the Lao have the whip hand; the Thai are ambivalent; and the downstream countries, Vietnam and Cambodia, can only protest ineffectively. Matters came to a head in 2011. 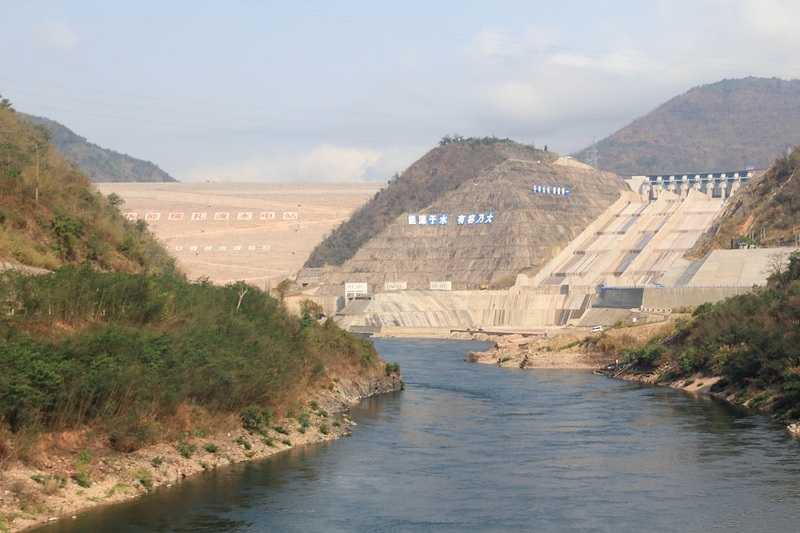 Back then, in meetings of the Mekong River Commission (MRC), senior diplomats and ministers from the riparian states considered the imminent start of construction of a 1,285-megawatt dam and hydropower plant near Xayaburi, a northern Lao town. Supported by Cambodia, Vietnam argued that construction should be deferred for 10 years pending further study of the downstream impacts of the dam. Thailand’s representatives squirmed uneasily. Though conscious of protests by environmentalists and farmers’ groups in their nation’s northeastern provinces, the Thai officials were also heavily lobbied by Xayaburi’s Thai developer and its intended customer, the Thai national power company. Lao officials listened, objected and at length declared that, having discharged their nation’s obligations under the MRC’s prior consultation process, they would greenlight the project. Thus Laos proved impervious to Western pressure, whether from governments, multilateral banks or the international media. Behind the representatives of the Lao regime, it has been easy to discern the hulking shadows of their Chinese patrons. The rest of the world has turned away from megadam projects, but dam builders are a formidable sector of China’s state industrial complex. Their quest for new business on the middle Mekong dovetailed nicely with their government’s pursuit of dominant influence in mainland Southeast Asia. Lao leaders were charmed by the idea that their poor and landlocked nation could become “the battery of Southeast Asia,” and use revenues from power sales to fund economic development. Chinese companies’ free-spending lobbying efforts rendered the Lao officials blind to negative impacts on the environment and rural communities, even in Laos itself. Western readers who have followed the Mekong dams issue understand it mainly as a matter of preserving the world’s richest freshwater fishery. That’s not a surprise; the Western media depends on fish-focused, Cambodia-based Western NGOs for information. And indeed, the impact of dam construction on migratory fish is a serious concern. Cambodians rely on the annual catch for 80 percent of the animal protein in their diets. Researchers agree that at least half that catch is at risk. No political process currently gives hope, but economics may yet avert the worst case scenario for the downstream countries. Specifically, the middle Mekong dam cascade looks less bankable now than it once did. Citing environmental and social costs, the World Bank and the Asian Development Bank decided in 2004 that they would no longer finance big dams on the Mekong or anywhere else. More recently, the region’s commercial banks, pondering the uncertainty of baseload electricity demand many years in the future and the political issues associated with the massive dams’ construction, have also shown considerably less interest in financing them. Whether more mainstream dams are built seems therefore to depend on whether Beijing is ready, either directly or indirectly via the newly formed Asian Infrastructure Investment Bank (AIIB), to guarantee its state-owned enterprises against losses. There’s no evidence that China is ready to give up the game. They have considerable ability to build dams and can leverage a dominant position in Laos to squeeze Vietnam while drawing other Southeast Asian nations further into the rising superpower’s political and economic orbit. Just a cloud on the horizon, meanwhile, is the Kong-Loei-Chi-Mun superproject, a Thai Royal Irrigation Department (RID) proposal to divert part of the Mekong’s flow. Water would be pumped from the Mekong’s junction with the Loei River, an insignificant tributary on the Thai side of the river about 125 kilometers upstream from the Lao capital, Vientiane. The waters so diverted would pass over and through a small mountain range and into the headwaters of northeast Thailand’s Chi-Mun river system. Newspaper reports say the project’s supposed to cost $75 billion, take about 16 years to complete, and irrigate 5 million hectares. That is, coincidentally, an area as vast as the lower Delta, including the Cambodian part, and so probably worth the cost of construction. The Irrigation Department’s diversion scheme surfaced a few years ago and then was pulled back, whether for further tinkering or because Bangkok was daunted by the negative reaction of neighboring nations. It didn’t stay gone, however. This spring there was serious drought in northeast Thailand as well as in the lower Mekong. When things got desperate in March, the newswires hummed with reports that the Thai government had authorized diversion of 47 million cubic meters of water from the Mekong. That’s just a drop in the bucket, so to speak, the equivalent of a mere 18,000 Olympic swimming pools, just enough to test the over-the-mountains pumping concept and Bangkok’s chances of facing down Hanoi, Phnom Penh and maybe also Laos. If fully implemented, the superproject is supposed to divert 4 billion cubic meters of water annually into Thailand’s dry northeastern provinces. Four billion cubic meters is four cubic kilometers, one percent of the Mekong’s average annual discharge into the Delta. The Thai have promised to consult. They’re dead wrong if they think the Vietnamese won’t raise a fuss. In the wake of the epic drought that decimated the winter-spring rice crop, Delta farmers are apt to blame upstream diversions and dams, rather than climate change, for an unprecedented bout of saline intrusion. Farmers are acutely aware that the customary rhythm of the seasons has been disrupted. 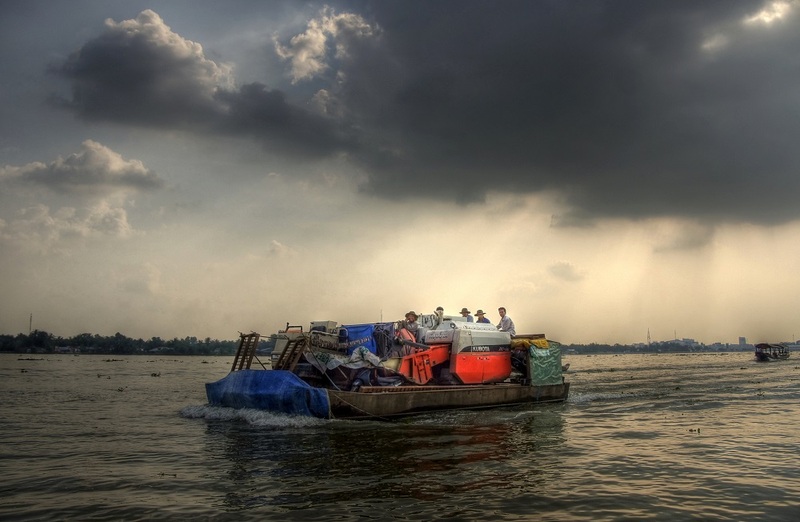 These are nervous times in Vietnam’s Mekong Delta.